Coconut Barfi/How to make coconut Barfi with step by step pictures. Hi buddies! Do you like sweets, than you are on a treat. 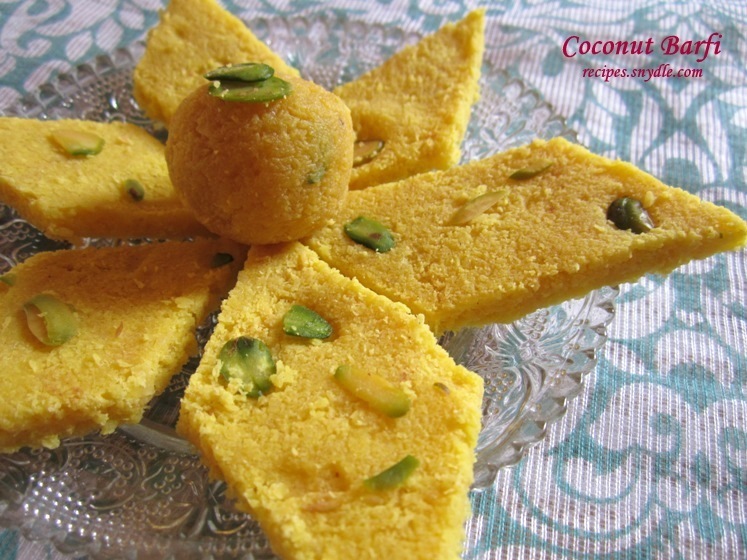 Today I am sharing simple and quick recipe of coconut barfi. Coconut barfi is also called as nariyal ki barfi but here I have used unseetened coconut flakes. 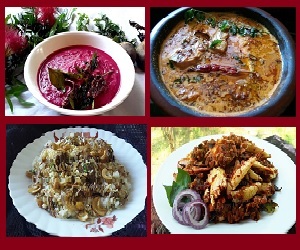 On any occasion we like to have sweets/desserts or even after lunch and dinner. So it’s a big question what to make? Because preparing sweets is little time consuming. Coconut barfi is a melt in the mouth and tastes luscious. Coconut barfi takes less time to get ready but needs continuously stirring, because the coconut gets red quickly and can spoil the whole taste of barfi. Perform the whole procedure on low flame. While stirring the mixture keep a check on the sugar. When the sugar melts and the mixture gets sticky and juicy it is a sign that the mixture is getting ready. 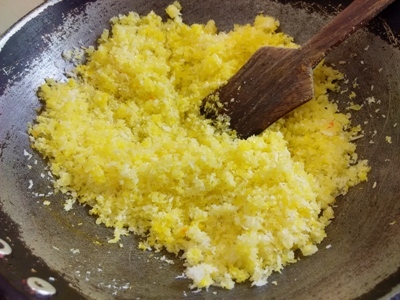 When the mixture starts leaving the edges of the skillet it means that the barfi is ready. Grease the plate with oil by the help of your hand; this will help to remove the barfi from the plate easily or else it may crack. 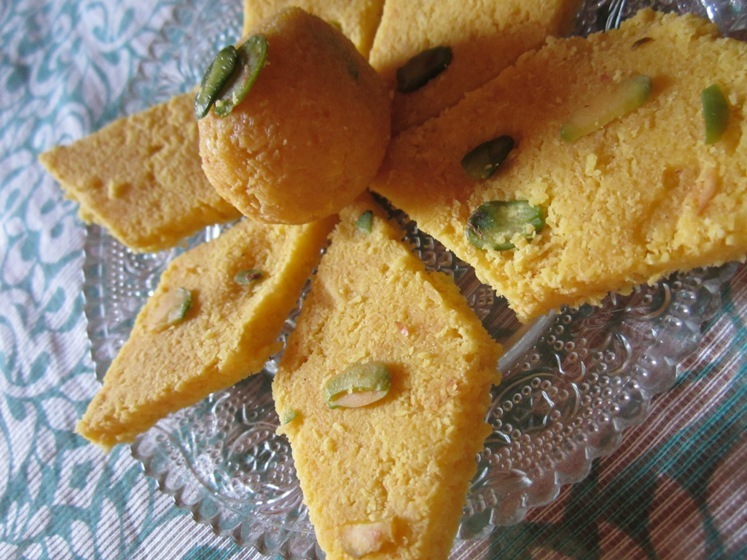 Cardamom powder, dry fruits and nutmeg powder is also added to the barfi to enhance its taste. But here I have made plain coconut barfi it too tastes luscious and only used pistachios for garnishing. 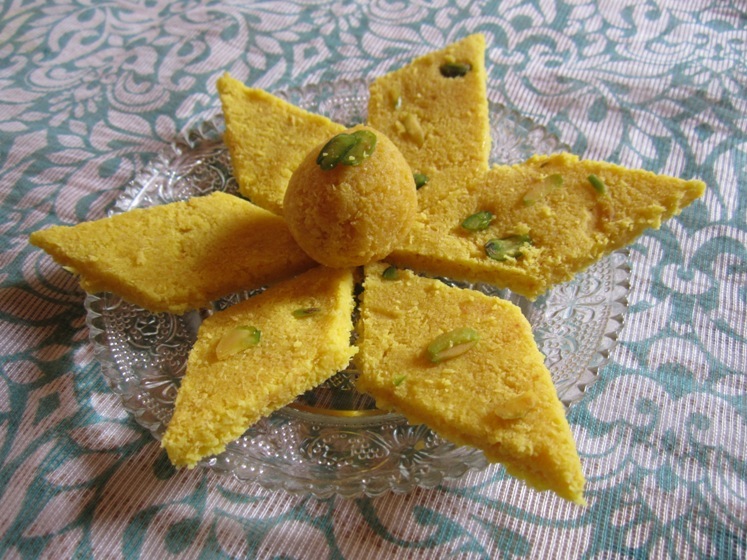 With the same mixture of coconut barfi you can make ladoo or can make barfis of different shapes any sizes. Consume fresh coconut barfi or store in refrigerator for a day or two.Try this simple version of coconut barfi and serve fresh and enjoy! How to make Coconut Barfi. 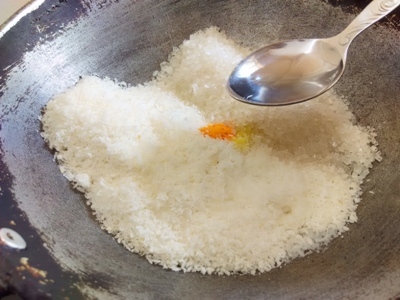 Heat a skillet and add unsweetened coconut flakes, sugar and yellow colour. You can also avoid using edible colour if natural barfi colour preferred. Add Clarified butter/ghee into the skillet. Mix it well and stir continuously at low flame. Now add milk to the skillet. Mix it well and stir continuously for 10 minutes at low flame. Stir continuously until the sugar melts and the mixture starts becoming sticky. Off the flame when the mixture begins to leave the sides of the skillet. Take a plate. 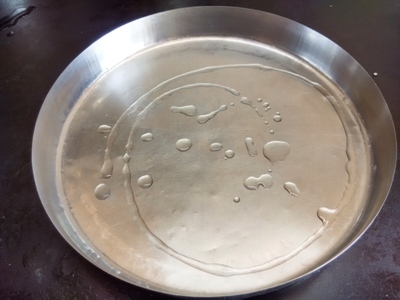 Now use oil to grease the plate with your hand. make sure that the oil is greased on the whole plate. 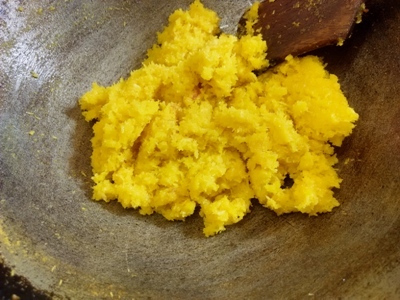 Now place all the mixture into the greased plate and press it evenly with the help of spoon. 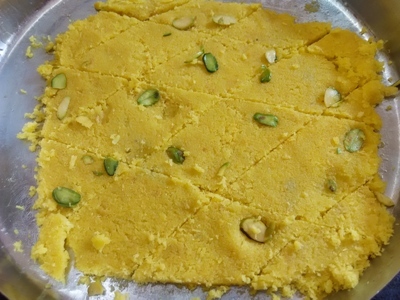 Cut into barfi shape or any shape that you prefer. 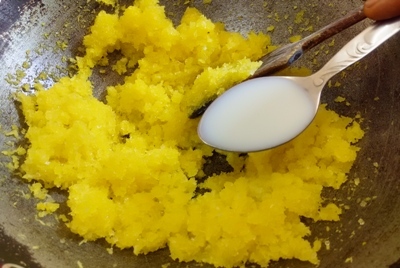 Execute this step when the mixture is hot for the reason that if the mixture cools down to the room temperature it will be difficult to give barfi shape or any shape. 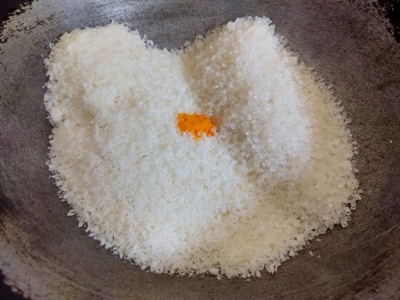 You can also give ladoo shape to the mixture. 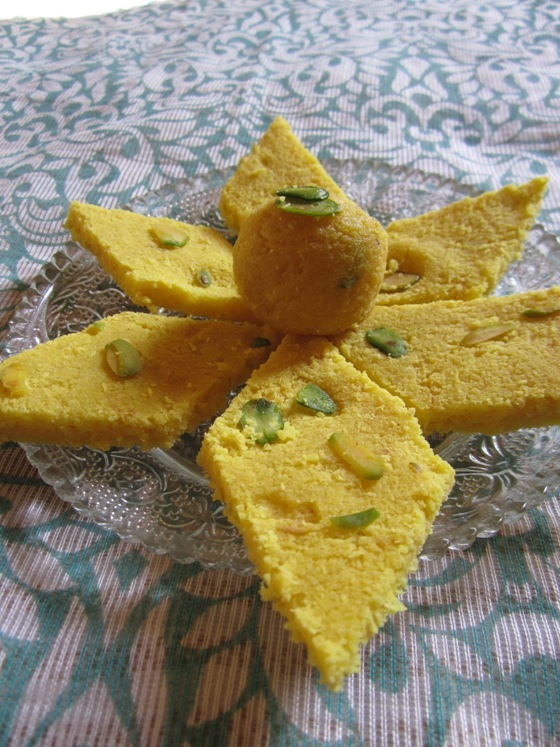 After the barfi cools down to room temperature with the help of spatula and remove barfi from the plate. Decorate it with pistachios and serve. Enjoy!